Masters Degree: the New Bachelor’s Degree? Home /Articles /Master’s Degree: the New Bachelor’s Degree? With the current economic situation and job competition, it’s easier to consider the ever-growing significance of higher education—especially a Masters Degree. There has been consistent growth in online college enrollment since 2002 and, according to the 2012 Survey of Online Learning, “the number of students who have taken at least one online college course has now surpassed 6.7 million”. [ii] But is a Masters degree and other higher education degrees becoming so significant today? The number of people who have bachelor degrees are increasing. According to the National Center for Educational Statistics (NCES), the percentage of people who earned a bachelor’s or higher rose from 22 to 32% between 1980 and 2011. [iii] With such growth in educational attainment, how can you set yourself apart from other people when it comes to employment? In the past, it was earning a Bachelor’s degree. Now, it seems to be a Master’s degree or even PhD. Debra W. Stewart, president of the Council of Graduate Schools, says that the number of Masters that have been awarded has doubled since the 1980s and the “rate of increase has quickened substantially in the last couple of years”. [iv] This data reveals a new higher ed trend. With this degree trend, arrives a distinction between degrees of the past and a Masters degree today. The popularity of a professional science masters or PSM is gaining momentum. It is a new type of graduate degree that encourages advanced training in STEM related fields like science and math, along with honing workplace skills. [v] A degree of this type could be attractive to employers who are seeking graduates with employable skills. Even humanities departments seem to want in on the professional degree action—for example, a Masters degree in public history that is geared for work in a museum[iv]—is now available at certain colleges and universities. With a tough economy, there typically is more of a need for increased networking. Through social media sites like LinkedIn, Facebook, and Twitter, along with connections made in graduate school, students might garner contacts that could lead to future career leads. Grad school may be a great way for students to interact with professors who are considered leaders in their fields and who may grant glowing recommendations when the time comes to apply for post-grad school jobs. What should you know about earning a Master’s degree if you are thinking about either continuing your education immediately after earning your Bachelor’s degree or if you will be returning to college after a long hiatus? How long will it take to finish my Master’s degree? Usually a Master’s degree takes around 2 years to complete; however, you may finish up sooner or later depending on your course load. 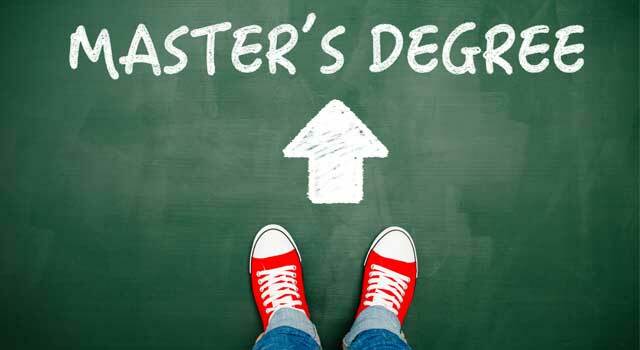 What types of Master’s degrees are available? The two most common types are a Master of Art (MA) or a Master of Science(MS). [vii] There are also focused degrees like a Master of Business Administration (MBA), a Master in Social Work (MSW), or a professional science Master’s degree (PSM). Will I have to write a lot? Only you can really answer this question. However, given the information above with a seeming surplus of Bachelor’s degrees and employers seeking employees with advanced education and skills, earning your Master’s degree may be the best decision you ever made. Even more exciting is the option to earn your Master’s degree online. You can even get into graduate schools to earn a Master's with an undergrad GPA of 2.7 or 2.8 - so don't let your undergrad grades stop you!